Why Use I-9 Compliance Software? Do I Have To E-Verify? With the current enforcement climate as intense as it is, it may be useful to take another look at the basics of the I-9, starting with its genesis. 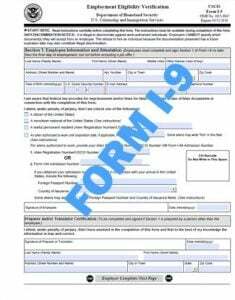 The Birth Of The I-9 Form & Its Reason For Being! Through the Immigration Reform and Control Act of 1986, Congress made employers liable for hiring or continuing to employ workers who are not authorized to work in the United States and created civil and criminal penalties for doing so. The theory behind this approach is that illegal immigrants will not come to the US if they cannot work, and the federal government drafted employers to execute the policy. The law thus requires businesses to verify identity and check work status, and the tool is the Employee Eligibility Verification form (I-9) which must be completed and retained for each employee. After 20 foreign terrorists who had entered the country legally committed the 9/11 attacks, Congress dismantled the Immigration and Naturalization Service and reshuffled the enforcement deck, placing all immigration issues under the purview of the nascent Department of Homeland Security (DHS). The agency’s entire purpose was to coordinate the nation’s strategy for preventing and responding to future terrorist attacks, and DHS separated immigration duties into three newly created departments. • US Customs and Border Protection would control America’s borders and facilitate international trade and travel. • US Citizenship and Immigration Services (USCIS) would focus exclusively on processing immigration applications. • Immigration and Customs Enforcement (ICE) would oversee and enforce the country’s immigration laws. This is how we reached the modern regulatory scheme that administers the mandates of the Immigration Reform and Control Act. USCIS sets up and manages the system through I-9s while ICE acts as the muscle, ensuring that the government’s will is carried out. Recently, ICE has been flexing like never before. FY 2018 saw the number of worksite investigations quadruple, and the agency has gathered additional resources and promised to continue to expand its heightened scrutiny of this avenue of immigration control. With such a bright light shining on employers, it’s more crucial than ever that businesses obey both the spirit and letter of the law or risk punishment for running afoul of it. The I-9 is a legal document around which a burgeoning area of administrative case law has formed. It does not represent a guideline or busywork. The information detailed in the form subjects both employers and employees to prosecution, and it contains supporting documents that contain varied expiration dates that must be tracked. Even honest mistakes made in good faith can generate civil penalties for both parties. Employers who have defied the government have paid millions in fines and other judgments and continue to sit in jail for the gamble. The I-9 is divided into three sections, each of which contains its own legal obligations. • Foreign Passport Number along with country of issuance. The employee’s signature is the legal mechanism that attaches the information he provides to the penalty of perjury which carries the same weight as giving false testimony in a court of law. The employer’s responsibility for this section is to ensure that the employee filled each field properly. Section Two: Employer or Authorized Representative Review and Verification — The employer must complete this section within three business days of the employee’s first day of work. Here, the employee presents the relevant combination of allowable documents, and the company’s representative physically examines the presented documents. If the employer discovers errors in Section One, the employee must correct them. After entering the appropriate data, the representative signs, thereby swearing under penalty of perjury that the presented documents reasonably appear to be genuine and that he believes the new employee is authorized to work in the US. • List A — identity and employment authorization. These documents can suffice without additional documents from the other lists. • List B — identity. A List B document must be presented in concert with an acceptable List C document. • List C — employment authorization. A List C document must be presented in concert with an acceptable List B document. • When the employee’s name is legally changed. Note that this section also subjects the employer’s representative to perjury charges through his signature. In the current culture of I-9 compliance, understanding the basics of the I-9 are imperative. For those that want to ensure they are compliant in every step of the process, working with a company that specializes in I-9 compliance software adds a valuable layer of protection against fines and penalties resulting from an ICE audit. Lookout Services was founded in 1998 by employment verification attorneys who recognized the complexities of I-9 compliance. With an understanding of the strict laws regarding deadlines and record-keeping – and the hefty fines non-compliant companies face – we set out to streamline the process.